At Rancho Bernardo Self Storage, we take special pride in actively participating in our communities. From youth team sponsorship to attending Chamber of Commerce events, as well as local festivals and fairs, we enjoy connecting with our fellow residents and businesses. Our managers and clerks are hands-on, friendly and know our tenants on a first-name basis. We put customer service first. Our main objective is to surpass our customers&#039; expectations with outstanding service, convenience and top-notch security. 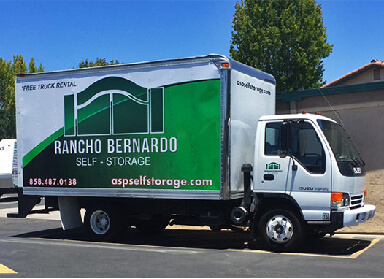 Rancho Bernardo Self Storage is one of 30 family-owned and operated storage facilities in the Southwestern U.S. Our parent company - A Storage Place - has been in business for over 35 years. Extremely pleasant and helpful staff. Went out of there way to make me feel comfortable and the move-in process easy. I’ve had a great experience with my storage unit. My belongings have stayed dry and undamaged during lots of rain last year and lots of heat. No evidence of vermin or bugs. People are friendly and flexible. Security is good. Gave 4 stars just because of price. May be comparable (haven’t checked around lately), but a little high for me. However, you get what you pay for. I like this storage facility since it’s clean and decent maintenance is provided. They also provide an RV dump and wash space, which is quite a value add. My issues, the rates continue to increase from $160 2 years ago and now at $220 per month. That’s definitely a cost to factor into your choice and RV purchase. Second, the spaces are VERY tight, with less than 18” on each side, between other Rav’s. Because they’re working to make every cent and every inch count, the angle of each space is poorly aligned. It’s great these guys are around, but there has to be better alternatives somewhere. Sorry RB Storage, just too high of price for many real issues. They have a moving truck you get to use once for free which was really convenient! The facility is always clean and they always keep me up to date on days they will be closed or units will not be accessible. Professional and friendly staff. Spotless facility. All very important when storing your personal treasures! The service at RB self storage is very good and the facility is very clean and secure. I would recommend this place to anyone looking for a nice place to store their stuff. I have stored at this facility for over 10 years. I have found the staff helpful and courteous whenever I have dealt with them. The facility is well kept, location is convenient, and price is reasonable. Staff is helpful. Great gate hours. Nice RV storage with a dump onsite. Freeway convenient and am able to pay my bill online. Most importantly great security for storing my RV. We are at that age when its time to downsize. We chose RB Self Storage because of its location but also because we found the staff to be friendly, helpful and accommodating to our needs. We have been in and out of the facility many times to access our belongings and each time the security was top notch and the grounds impeccably clean. We would highly recommend RB Self Storage if you ever need a storage facility.